Quick Delight: Saltiest Food Cart Award? 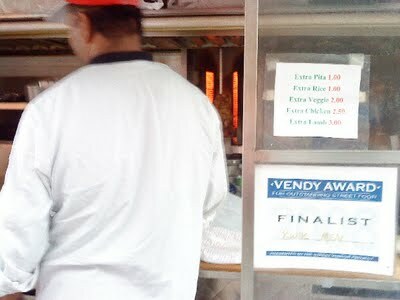 Walking around the other day, I saw this sign: VENDI AWARD FINALIST. No way! Really??? Around midtown east?? ?… man! I was so excited I planed out my lunch a week ahead, and today was the big day. I anticipated it the whole day, even during my morning oatmeal ritual I couldn’t stop thinking about this, as soon as the clock hit 12:30pm, I was there. The menu even says this cart is supervised by this guy who use to work for the Russian Tea Room, hmm interesting. Made me want to try the food even more. I asked the 2 man of very few words about their best dish, “chicken over rice”. Right after I ordered that, I saw this beautiful chicken shawarma, so I requested some of that in my dish. The boys were happy to let me try some, and everything went on the grill. They answered some of my questions, but didn’t really seem to care about my excitement, I even asked him about the Vendi Awards, again, man of few words. I guess a Japanese magazine featured them, so he showed me the framed article, but I don’t read Japanese! hello! I’m chinese, by this point my food was almost ready and I couldn’t wait. There were a couple regulars on the short line, so this should be great rite? So here’s the final product for $5.50. 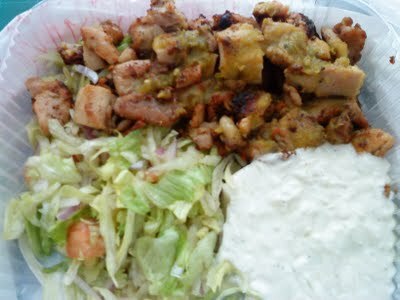 The Chicken Shawarma was tasty, marinated with an array of spices. The regular chicken cubes (all dark meat) was tender and everything is topped with their Jalepeno sauce, it has a nice kick, tangy and spicy. The rice had a hint of coconut (not as intense as the malaysian restaurants). The salad was fine, but the yogurt sauce doesn’t even come close to the guys from 53rd and 6th. It wasn’t as creamy or smooth, instead it felt like it had some chunks (think cottage cheese, but runny). It’s not that things tasted bad, but it was hard to enjoy it all when it was so salty. The chicken shawarma had a grilled flavor I liked, but seriously, was salt on sale? It wasn’t like they were selling drinks, so this surely wasn’t on purpose, maybe a bad day? I don’t know, but after eating it, I must of chucked down 2 or 3 bottles of water. It was a disappointing lunch for sure. Good thing portions weren’t too big. 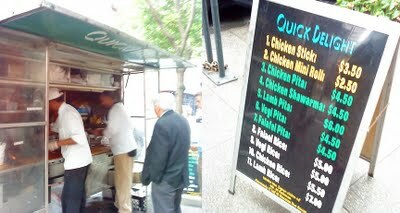 For now, I’m sticking to my favorite chicken over rice from 53rd and 6th. If you must visit and taste for yourself, they are parked at the corner of 45th st and 3rd ave.